Btrfs, which can be pronounced as “Butter FS”, “Better FS”, or “B-Tree FS”, is a modern file system that began development back in 2007. It was merged into the mainline Linux kernel in the beginning of 2009 and debuted in the Linux 2.6.29 release. Btrfs is GPL-licensed but currently considered unstable. Thus, Linux distributions tend to ship with Btrfs as an option but not as the default. Btrfs exists because the developers wanted to expand the functionality of a file system to include pooling, snapshots, and checksums among other things. Btrfs is not a successor to the default Ext4 file system used in most Linux distributions, but it can be expected to replace Ext4 in the future. Btrfs is expected to offer better scalability and reliability. It is a copy-on-write file system intended to address various weaknesses in current Linux file systems. Primary focus points include fault tolerance, repair, and easy administration. In this article we will show that how you can roll back to the previous system state with apt-btrfs-snapshot on your Linux system that uses the btrfs file system. Any failed operation takes away much of the pain system administrators have to deal with normally as apt-btrfs-snapshot creates a snapshot of the system before any apt operation. In this way we will be able to easily restore the previous system state which is one of the greatest features of the btrfs file system. In order to create snapshots and restore your Linux system using btrfs, you need to install the whole system on a btrfs file system and there should be no separate /boot partition on an ext file system. If you use a separate /boot partition and apt installs anything in that partition , you cannot undo changes to the /boot partition with apt-btrfs-snapshot as only changes on the btrfs partition can be reverted. Once your file system is on btrfs then login your servers using root user credentials to get started. Let’s run the following command to install ‘apt-btrfs-snapshot’ package on your Linux server before using it. Once the package is installed, check if apt-btrfs-snapshot is able to create snapshots on apt operations by running the following command. If it display ‘Supported’ in its output then all is set to go. If it doesn’t then your btrfs subvolume layout probably differs from Ubuntu’s server default layout. You can check the default layout of btrfs subvolumes on Ubuntu server with below command. To test the rollback operation to the previous state, we are going to run some apt operation like apt-get upgrade using below commands as shown. Run below commands to update your package database and upgrade your system. Press ‘Y’ key to continue, during the system upgrade process, you will see that an ‘apt-btrfs-snapshot’ has automatically created as snapshot of our system before the upgrade as shown in the image. You can also check the list of your current snapshots with following commands. Now if you want to restore the previous system state in case of any failure during the system upgrade and you want to do a rollback. To do so let’s mount the btrfs filesystem to a separate location, fol example /mnt . List the ‘/mnt’ directory and you will see subvolumes in its output. 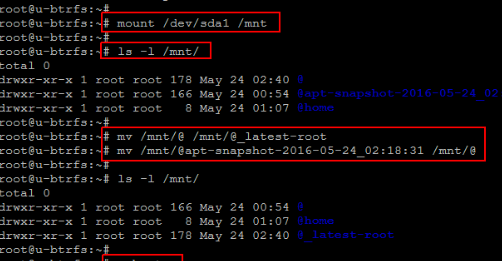 Where ‘@apt-snapshot-2016-05-24_02:18:31′ is a snapshot of our working root filesystem (@) before the apt operation. In order to make the system boot from that working snapshot instead of from the current subvolume, we rename @ to something else and then @apt-snapshot-2012-11-22_11:50:38 to @ . After renaming reboot your system and you will be glad to see that your system is at the previous state of before system upgrade. You can confirm by repeating the ‘apt-get upgrade’ command which will show the same packages to be upgrade. After successfully restoring the file system, now if you wish to delete this volume to make some free space on your system. Then run the below command after mounting the volume. A Btrfs snapshot is actually a subvolume that shares its data with some other subvolume, using Btrfs’ copy-on-write capabilities, and modifications to a snapshot are not visible in the original subvolume. Once a writable snapshot is made, it can be treated as an alternate version of the original file system. For example, to rollback to a snapshot, a modified original subvolume needs to be unmounted and the snapshot needs to be mounted in its place. So, at that point, the original subvolume may also be deleted. Btrfs is becoming increasingly important to the future of Linux systems as its possible to dynamically resize mounted filesystems which can span physical volumes, with optional RAID support. While physical volumes can be added to and removed from mounted filesystems. More over you can take the snapshots including read-only and read-write.